This project will develop a new technique for non-invasive imaging of the current flow within the electrolyte of a typical Li-ion pouch cell used in automotive applications. We will assess the feasibility of deploying the quantum magnetometer sensor technology for in-situ current measurement within EV battery modules. We will produce a demonstrator system delivering real-time performance data from a battery module using new sensors and image analysis algorithms. The system will be integrated into a module level battery management system (BMS) and provide a roadmap for implementing a production system the pack level. > Capturing high frequency data feeds of thermal and magnetometer sensors using micro-controllers and image sequences analysis using Matlab. > The development of algorithms for feature and anomaly detection in sensor images. 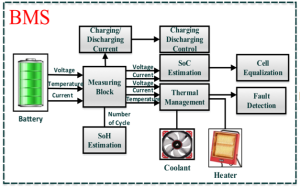 > The integration of the resulting data and algorithms into a real-time hardware-in-the-loop simulation of battery management system (BMS). For the battery management system, we will develop an adaptive single-particle aged LiB model along with a specially designed in-cell sensor/antenna to accurately estimate the critical battery parameters, i.e. electrochemical, thermal, ageing and degradation, state-of-charge (SoC) and state-of-health (SoH), all in realtime for the safe and durable operation of the aged LiBs. We will design a controller/observer to optimise the ageing model parameters, balance the power within the battery pack and reduce the response time in converter/battery pack communications. We further design a controller for the microgrid to provide intelligent power management and ensure the stable operation of the whole system. We also investigate a low-cost ventilation/cooling system that it can withstand random thermal variability of the aged LiBs in case of unexpected ambient temperature rise (up to +60C). > Develop online estimator/observer for the accurate SoC estimation. > Cell balancing to improve power management. > Integrated control of bi-directional charger and battery pack. > Integrated condition monitoring to guarantee reliability and safety of the charger and the pack. > Development of a special ventilation and cooling system to maintain the battery life-cycles in high temperatures. The position is closed now for the Research Assistant/Associate in Condition Monitoring of Vehicular Li-ion (Pouch) Batteries for my Innovate UK project. Selection is in process.